Here’s how to make a fluffy Easter bunny from small pompoms. 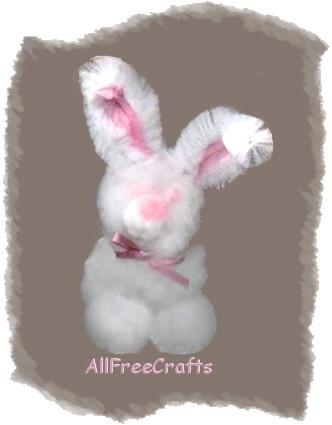 When making this fluffy bunny, look at our photo often to help with placement of the pompoms. Glue together the extra large and large white pompom. Trim away one side to create a flatter tummy and face for the bunny. Glue together two small white pompoms and one small pink pompom for the bunny’s nose. Add two teeny white pompoms for teeth (as shown in photo) by gluing the pompoms at the bottom of the joined white pompoms. Glue the nose and teeth piece to the bunny’s face. Glue two medium white pompoms to the bottom of the extra large pompom for bunny feet and glue another medium pompom to the back for a bunny tail. With a scrap piece of ribbon, make a bow and glue to the bunny’s neck. Glue two teeny pink pompoms for eyes. To make the bunny’s ears, cut a pink chenille stem about two inches long (this size will vary depending on the size of pompoms you choose). Fold the stem in half. Wrap a piece of white chenille stem around the outside perimeter of the pink stem and secure by twisting all four ends of the stems together. Place glue where the chenille stems are twisted and glue in place on the bunny’s head. You can twist and shape the ears as you like. If you glue a magnet piece to the back, you’ll have a cute little fridge magnet or glue a jewelry pin or push pin to the back and you’ll have a cute little pin or bulletin board tac. These are fun little bunnies to make and if you make them small enough, they can be inserted into plastic two-part Easter Eggs or simply place them in an Easter Basket.